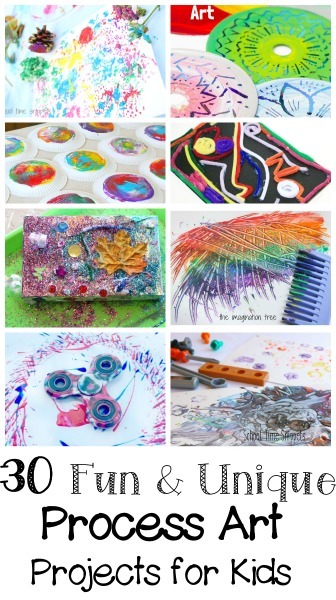 30 Process Art Projects Your Preschooler Will Love! A collection of 30 fun and unique preschool process art ideas you ought to try! From painting to collage to sculptures, there is a process art idea (or two) your preschooler will love! The lazy days of summer allow creativity and imagination to take center stage. Too often during the school year we are often so focused on reading, writing, math, and everything else BUT ART, that I love to make it our focus during the summer months. This collection of process art activities can be done year-round, but the warmer days are the perfect reason to get outside and bring out the paint without fear of it having spill all over the floor, furniture, counters, etc. etc!! Painting in the grass puts me much more at ease! Don't you agree? Or, if the weather isn't cooperating-- don't let it put a damper on your creativity, make a fun process art collage or sculpture, instead! What is the big deal? Is process art important? YES! Process art is very important to the young developing child! Process art is the open-ended creativity that is child-led. With process art, there are no "how-to's," instructions, or "right/wrong" way to create. Process art is the is unique and original and entirely the child's own. According to the National Association for Educating the Young Child, process art is often relaxing and children may eagerly ask to create another or be so engrossed in the project that he/she needs more time to create! So, give it a try! Present your preschooler with materials and see their creativity flow! So here's a collection of 30 Unique Process Art Projects I think you ought to try! 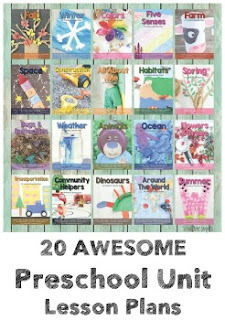 Many of these are preschool process art projects, but I think they will appeal to kids of all ages! Some may require adult supervision with materials like a hot glue gun, so be mindful and ready to help when picking out a process art project to do with your little one(s). Cloudy Day Process Art --Great for preschool and/or Kindergarten kiddos with an interest about learning about the clouds in the sky! Process Art Junk Sculpture --One of my favorite projects of all time! We even have another growing collection of "junk" to make another sculpture soon! Painting with Nature-- Take a nature walk to collect some things and then bring it back home and create! Starry Sky Process Art --With just one material the end result made me think of starts in the sky! Pipe Ceaner and Beads Sculpture --Kiddos of all ages will enjoy this activity-- make it a collaborative project! This idea was inspired by Alexander Calder, but you could just gather the materials and create instead. Tape Resist Snowflake Canvas --You might not want to do this one during the summer, BUT the idea works the same without making a snowflake. Foam Shapes Collage Art --This was a mix of color sorting and free art-- great for little ones. Fly Swatter Painting from Munchkins and Moms --With flies in full force this summer, grab an extra one for a fun outdoor painting activity! Looks so fun!... and messy! Decorated Tree Branch Art from Stay at Home Educator --Grab some neighborhood kiddos for a tree branch painting party, then proudly display those colorful branches in a vase! These remind me of our Twig Icicle Christmas ornaments! Fidget Spinner Fireworks from Twitchetts -- Fidget spinners: the latest kid craze! Create a unique piece of art that looks like fireworks! Citrus Painting for Kids from Rhythms of Play --I've seen painting with various fruits and veggies before; we've done our own apple printing while reading How To Make An Apple Pie and See the World, but never thought to use citrus fruits! Duplo Block Painting from Raising Little Superheroes -- Process art allows you to create with pretty much anything around you. Get into your kiddo's LEGO Duplo stash and some paint and create some unique patterns using these building block. If your kiddos want more direction or are interested, encourage them to create Duplo Robot Prints! Squirt Gun Painting from Fireflies and Mudpies --Perfect process art activity for summer! Yarn Painting from Busy Toddler -- We've created some lovely crafts by yarn wrapping (spring tulips and rainbows), but have never just tried painting with it! CD Scratch Art from Kids Craft Room --I think the older kiddos would get into this activity! My kids had fun mark making our scratch art owls! Cursive Name Art from 123Homeschool4Me -- If you had a kiddo recently learn cursive, they'll love this activity! Turn your own name into a unique cursive alien! Alternatively, you can write your preschooler's name in cursive and have him/her turn it into a monster or alien! Now if your kids are like mine, usually one process art project just won't cut it-- my kids make multiple copies-- and with 4 kiddos, that's A LOT of artwork!!! But alas, instead of throwing them away (! ), here's 15 creative ways to recycle those creative art projects!! !